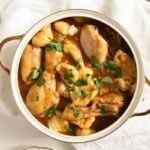 How to make Hungarian Chicken Paprikash with Dumplings, one of the best traditional Hungarian dishes. First of all here is the recipe for the Hungarian Flour Dumplings for Goulash and Paprikash – Nokedli. I decided to post them in a different post because they are a part of not only this Chicken Paprikash, but also of the Hungarian Pörkölt recipe coming tomorrow. And you can make the dumplings part of many other meals as well, you could have them with many other stews, you could add them to soups, you could even have them plain with some butter or cheese. Really the best Hungarian dish, if you ask me. 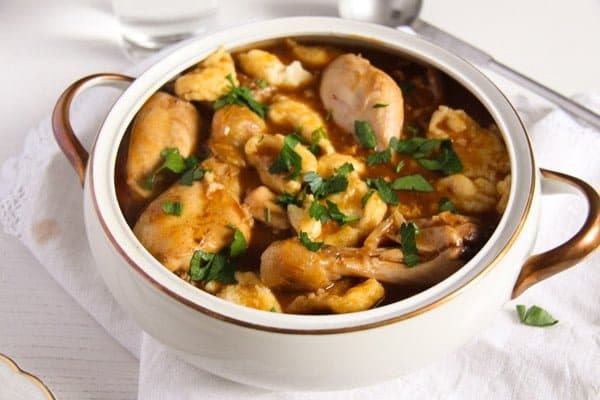 🙂 I love Hungarian inspired food, I grew up with it and there are many Hungarian recipes I love, but chicken paprikash with dumplings is my favorite. My grandmother used to make this dish on a regular basis, I really could not count the times I have eaten chicken paprikash in my life. And always the same recipe, nothing ever changed. I got this recipe from my grandmother and the dumpling recipe from my cousin Georgiana, which I am sure makes the same dumplings my grandmother ever made with the slight addition of a little bit of yogurt or smetana, which makes the dumplings a tick softer and fluffier. 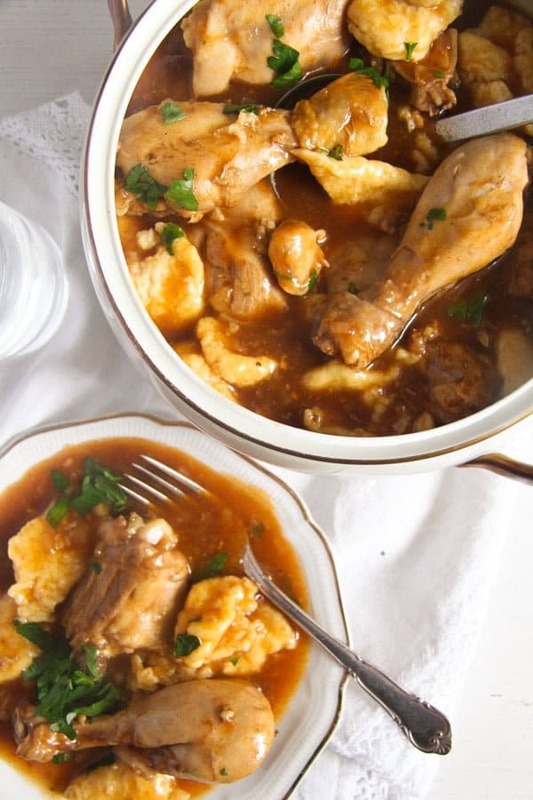 So, if you are in the mood for a real Eastern European treat, do give this Easy Hungarian Chicken Paprikash with Dumplings a try, you will so love it!!! 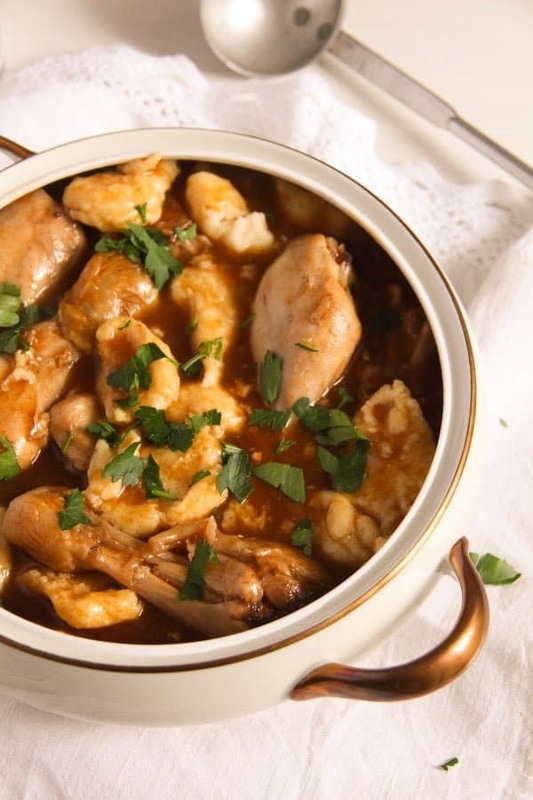 Many times I use a whole chicken of about 1,2 kg/ 2.6 lbs to make the Easy Hungarian Chicken Paprikash with Dumplings, but you can definitely use only chicken legs (which I also do often) or even only chicken breast, if you would like to go for a leaner version. The advantage of using a whole chicken is having both the legs (for the kids) and the breast (for me). If using only the legs of the chicken, I divide them at the joint. If using a whole chicken, I cut it into pieces: thighs, drumsticks, breasts. 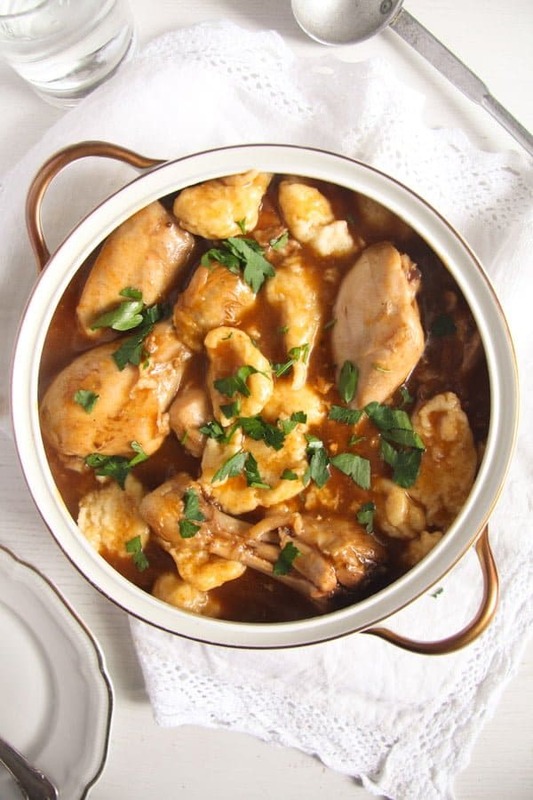 I never give the chicken wings to the paprikash, I save them together with the back bone and any other pieces I don’t want in the paprikash for making soup. So, when making paprikash it is mostly so that we have paprikash one day and chicken soup the next day. I use chicken stock to make the paprikash, I almost always have it on hand, but water should do the job as well, you might just have to adjust the taste with a bit more salt and pepper at the end of the cooking process. For making the Hungarian Flour Dumplings – Nokedli needed to complete this recipe, have a look at the link. Cut the chicken into pieces: thighs - halve them as well, drumsticks and breasts. Keep the chicken wings, backbone and other parts for making chicken soup or chicken stock. If using only chicken legs, divide the legs at the joint and halve the thighs. Remove the skin, if you like. 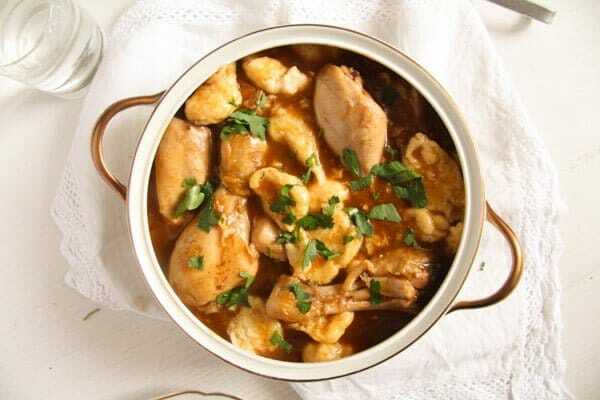 Heat the oil in a heavy bottomed pot or Dutch oven large enough to hold all the chicken parts. Chop the onion finely and fry it for a few minutes or until golden. Add the sweet paprika powder and stir well to coat the onions. Place the chicken parts in the pot and start adding the chicken stock, only 300 ml/ 1 1/3 cups at the beginning. Cover the pot and cook on low heat for about 30 minutes or until the chicken is cooked through and soft. Check and stir carefully from time to time and add the remaining stock if you think it is necessary. I normally do add it, I love the sauce. In the meantime prepare the dumplings, following this recipe. To thicken the sauce, stir the cornstarch with a little water to form a paste. Make a little room in the middle of the pot and stir this paste into the cooking sauce while whisking all the time to avoid getting clumps. Stir everything carefully and let cook for another 1 or 2 minutes until the sauce thickens slightly. Adjust the taste with salt and pepper. Drain the dumplings well and give them to the chicken paprikash. Stir carefully to coat them with the sauce. Sprinkle the dish with some chopped parsley and serve. My favorite side dish for paprikash are gherkins or Green (Unripe) Tomato Pickles. This one was really good. Can´t wait until you cook it again. Lovely greetings! This looks amazing. And those dumplings! 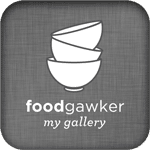 They sound wonderful and I love that you can use them so many ways! This looks so good and seems pretty easy to put together. I am totally craving hearty dishes, stews, roasted meats and things right now. This would make a wonderful dinner with the family. Very similar to the Goulash and dumplings my Mother and Grandmother taught me to cook, the only difference is that we add tomato and capsicum to the sauce for extra flavour. Have you ever added bell peppers (green plus any other colors you want) and tomatoes? So good! I am Hungarian on both sides, and Paprikas Csirke is a much beloved standard in any Hungarian kitchen. It was my late father’s favorite! However, we always had finely chopped tomatoes and green peppers in the sauce. It is a great dish, Judith. Adding tomatoes and green peppers sounds delicious!